رحیمدل میبدی, مهدی, امیری, امیرحسین, کرباسیان, مهدی. (1395). استراتژی‌های پایدار تکاملی دفاع و حمله با وجود اهداف مجازی و رویکرد قابلیت اطمینان. 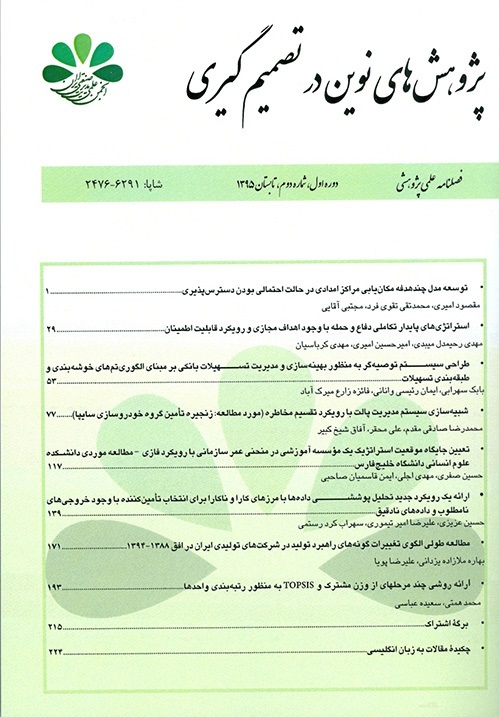 پژوهش های نوین در تصمیم گیری, 1(2), 29-52. مهدی رحیمدل میبدی; امیرحسین امیری; مهدی کرباسیان. "استراتژی‌های پایدار تکاملی دفاع و حمله با وجود اهداف مجازی و رویکرد قابلیت اطمینان". پژوهش های نوین در تصمیم گیری, 1, 2, 1395, 29-52. رحیمدل میبدی, مهدی, امیری, امیرحسین, کرباسیان, مهدی. (1395). 'استراتژی‌های پایدار تکاملی دفاع و حمله با وجود اهداف مجازی و رویکرد قابلیت اطمینان', پژوهش های نوین در تصمیم گیری, 1(2), pp. 29-52. رحیمدل میبدی, مهدی, امیری, امیرحسین, کرباسیان, مهدی. استراتژی‌های پایدار تکاملی دفاع و حمله با وجود اهداف مجازی و رویکرد قابلیت اطمینان. پژوهش های نوین در تصمیم گیری, 1395; 1(2): 29-52. یکی از مهم‎ترین اهداف سازمان‌ها، تعیین استراتژی‎های مطلوب و پایدار برای دفاع از سیستم‎های حساس و حیاتی است و برای رسیدن به این هدف، می‌بایست با توجه به شرایط دفاع و حمله، راهبردهای کارآمد و استوار تعیین شوند. در این تحقیق با هدف بهبود قابلیت اطمینان، ابتدا الگویی برای مدل‎سازی استراتژی‌های بهینه دفاع و حمله در حالت ایستا، ارائه می‌شود که در آن، مدافع برای فریب‎دادن مهاجم‌، تعدادی اهداف مجازی ایجاد می‎نماید. در این مدل ایستا، با توجه به احتمالات موجود در حمله موفق، قدرت تشخیص مهاجم در شناسایی اهداف مجازی و رویکرد تئوری بازی‎ها در پیدانمودن نقطه تعادل، یک مدل برنامه‌ریزی غیرخطی برای تعیین میزان سرمایه‌گذاری دفاع و حمله تمامی زیرسیستم‎ها، پیشنهاد شده است. سپس با توجه به نتایج به‌دست آمده از مدل پیشنهادی ایستا، پویایی سیستم و مفاهیم نظریه تکاملی بازی‌ها، یک روش جدید و پویا برای تعیین استراتژی‌های پایدار دفاع و حمله معرفی می‌شود. با توجه به الگوی ارائه‌شده، استراتژی پایدار تکاملی در طول زمان، برای مدافع مبنی بر استفاده و یا عدم استفاده از اهداف مجازی، از منظر مهاجم شامل حمله نمودن و یا عدم حمله و همچنین، از منظر سیستمی، مورد بررسی قرار می‌گیرند. در نهایت، مدل ارائه‌شده تحقیق برای یک مثال عددی، استفاده‌شده و نتایج آن مورد بررسی و تجزیه و تحلیل قرار گرفته است. Determining the optimal and sustainable strategies to protect critical and sensitive systems, is one of the main objectives of the organization. To achieve this goal, efficient and stable strategies must be determined. In this paper first, modeling the optimal strategies to defend and attack in the stationary state is presented, provided that the defender to deceive the attacker provides a number of false targets. In the static model, considering the probability of a successful attack, attacker capability in identifying false targets, reliability block diagram and game theory approach in finding the balance point, a nonlinear programming model is proposed to determine the amount of investment defend and attack. Then, according to the results of the static model, system dynamics and implications of evolutionary game theory, a new and dynamic approach to determine sustainability strategies of defense and attack is presented. According to the proposed model, evolutionary stable strategy for the defender, attacker and system is examined. Finally, presented model is illustrated for an applied case and final findings are analyzed. XinyangD., Xi. Z., Xiaoyan S., Felix T.S.C., Yong H., Rehan S., Yong D. (2014) "An evidential game theory framework in multi Criteria decision-making process", Applied Mathematics and Computation, 244 (1):783–793. Yong W, Gengzhong F., Nengmin W, Huigang L. (2015) "Game of information security investment: Impact of attack types and network vulnerability", Expert Systems with Applications, 42(1): 6132–6146. Hausken K. (2008) "Strategic defense and attack for reliability systems", Reliability Engineering and System Safety, 181(1): 1740–1750. Hausken K. (2010) "Defense and attack of complex and dependent systems", Reliability Engineering and System Safety, 95(1): 29-42. Levitin G, Hausken K, Yuanshun D. (2014) "Optimal defense with variable number of overarching and individual protections", Reliability Engineering and System Safety, 123(1): 81–90. Weibull J.W. (1995) "Evolutionary Game Theory", MIT Press. Maciejewski W. (2014) "Reproductive value in graph-structured populations", Journal of Theoretical Biology, 340(1): 285–293. Allen B., Nowak M. A. (2014) "Games on Graphs. EMS Survey", Mathematics Science, 340 (1):113–151. Nowak M. A., Tarnita C. E., Antal T. (2010) "Evolutionary dynamics in structuredpopulations", Journal of Theoretical Biology, 365(1): 19–30. Imhof L. A., Nowak M. A. (2006) "Evolutionary game dynamics in a Wright–Fisher process", Journal of Mathematical Biology, 52(5): 667–681. Hellmann T., Staudigl M. (2014) "Evolution of social networks", European Journal of Operational Research, 234(1): 583–596. Changhyun K., Terry L. F., Reetabrata M., Tao Y., Baichun. F. (2009) "Non-cooperative competition among revenue maximizing service providers with demand learning", European Journal of Operational Research, 197(1): 981–996. Gangshu C., Ned. K. (2009) "An evolutionary game theoretic perspective on e-collaboration: The collaboration eﬀort and media relativeness", European Journal of Operational Research, 194(1): 821–833. Chyi J. L, Chung Y. T, Chayakrit. C., Ming D. (2012) "Dynamic decision-making in a two-stage supply chain with repeated transactions", International Journal of Production Economics, 137(1): 211–225. Gilberto A. S. S, Renato. A. K. , Rodrigo C. C. (2012) "A differential evolution approach for solving constrained min–max optimization problems", Expert Systems with Applications, 39(1):13440–13450. Cramer A., Sudhof S., Zivi E. (2009) "Evolutionary algorithms for minimax problems in robust design", IEEE Transactions on Evolutionary Computation, 13(1): 444–453. Yihui Q., Zhide C., Li. X. (2010) "Active defense model of wireless sensor networks based on evolutionary game theory", 6th International Conference on Wireless Communications Networking and Mobile Computing, pp.1–4. Jiang W., Fangbin X. (2009) "Evaluating network security and optimal active defense based on attack–defense game theory", Chinese Journal of Computer, 32(4): 44–53. Tullock G. (1980) "Efficient rent-seeking, In: Buchanan JM, Tollison RD, Tullock G., Editors. Toward a theory of the rent-seeking society", College Station: Texas A&M University Press, pp.97–112. Fontanini W., FerreiraP. A. V. (2014) "A game-theoretic approach for the web services scheduling problem", Expert Systems with Applications, 41(1): 4743–4751. Abdolalipour A., Nazemi J., Toloie Eshlaghi A., Hosseinzadeh Lotfi F. (2014) "Service recovery chain response time coordinating mathematical model through bilevel programming approach", Management Research in Iran, 17(2):196–222 (in Persian). Mirfakhraddiny S. A, Babaei Meybodi H., Morovati Sharifabadi A. (2013) "Predicting energy consumption of Iran via a hybrid model of artificial neural networks and genetic algorithms and comparing it with traditional models", Management Research in Iran, 18(1): 171–191 (in Persian). Konak A., Kulturel-Konak S., Lawrence V. S. (2015) "A game-theoretic genetic algorithm for the reliable server assignmentproblem under attacks", Computers & Industrial Engineering, 85(1): 73–85. Zhide C., Cheng Q., Yihui Q., Li X., Wei W. (2014) Dynamics stability in wireless sensor networks active defense model, Journal of Computer and System Sciences, 80(10): 1534–1548. Zhenyuan G., Xingfu Z. (2015) "Impact of discontinuous harvesting on ﬁshery dynamics in a stock-effort ﬁshing model", Journal of Communication in Nonlinear Science and Numerical Simulation, 20 (1):594–603.